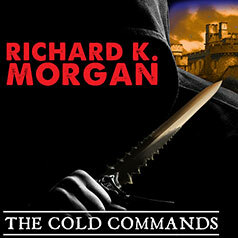 The Cold Commands continues award-winning author Richard K. Morgan's brilliant epic fantasy series begun in The Steel Remains. Only a select few have earned the right to call Gil friend. One is Egar, the Dragonbane, a fierce Majak fighter who comes to respect a heart as savage and loyal as his own. Another is Archeth, the last remaining daughter of an otherworldly race called the Kiriath, who once used their advanced technology to save the world from the dark magic of the Aldrain—only to depart for reasons as mysterious as their arrival. Yet even Egar and Archeth have learned to fear the doom that clings to their friend like a grim shadow...or the curse of a bitter god.